Just over two years ago, I received a late invitation from a friend asking if I wanted to accompany her to Turkey for a long weekend. Quicker than you can say Bosporus, I packed my bags and headed to the city which unites Europe and Asia, Istanbul, ready to explore its narrow souks for beguiling textiles from across the country. That trip has since inspired a particular style of decoration which I want to share with you, combining both the ancient and the modern with fresh, travel-inspired ideas to bring Turkish flair to your home. 1. If you want your home to stand out from the crowd and have a wow factor, consider adding the iconic floral Iznik tile decals. Beautiful tiles are a perfect way to upgrade your home without major renovation as you can change the look of your home quickly and without too much work. Original Turkish blue and turquoise tiles are hand painted and are suitable for bathrooms and kitchens as well as outside patios, stairs raisers and floors. Timeless colours include electric blues, pure whites, vibrant reds, glorious turquoise and muted petrol blues. You can find exciting tile designs that combines both the traditional and contemporary on various online shops and companies. They give your home an unusual mixture of delicate, ancient and bold graphic patterns that grab attention and provide a luxurious feel. I’m a huge, huge fan of colourful, bold tiles but I also know they can be pretty pricey. You don’t have to spend a fortune to completely transform a room as they also come in economical replicas in sticker form. This revolutionary method needs no time as Installation is as easy as peel and stick. 2. Using copper accents is a great way to add instant warmth, elegance, and rustic glam to your interior. To get lost inside the Grand Bazaar in Istanbul is to immerse yourself in a sea of ​​stalls that offer all kinds of copper, brass, silver and other metal handwork. You will see ibrik sets (containers with a spout), coffee pots, ewer (vase-shaped pitchers), large decorative platters, tea sets, spa bowls, lamps and lanterns. Copper has been on-trend for a long time and I believe it is here to stay. So let’s embrace it with Turkish character and make your interior fresh and sophisticated with a touch of exoticism. Whether you are remodeling your kitchen or just need some original accents around the house, Turkish copper pieces will add that perfect elegance. 3. To personalise drawer and cupboard handles, add ceramic Turkish inspired knobs. To make a house a home, finishing touches are needed. These ceramic and porcelain flower door knobs in dark blues and beautiful whites will allow you to really express yourself as a person who likes to travel to exotic places around the world. With their geometric designs and sophisticated blue-and-white florals they also have the power to transform a plain dresser into a stylish cabinet upgrading your bedroom furniture. 4. Brighten a dark room, add zest to a cold apartment or divide an open-plan space with an exquisite Oushak carpet. They are highly sophisticated and decorative rugs that come in gentle colours, great for creating a relaxing atmosphere. 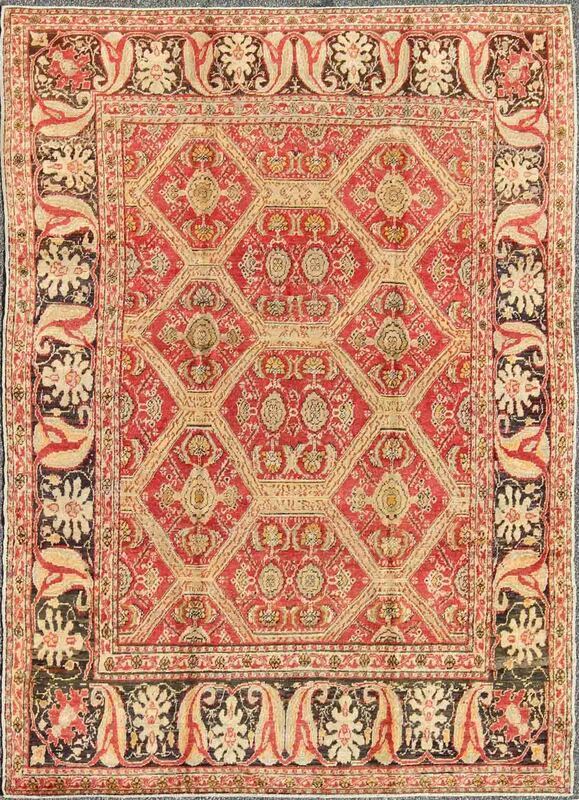 Oushak rugs, originally in the small town of Oushak (today south of Istanbul), have been greatly influenced by Persian designs. Today, Oushak rugs are highly desirable and decorative for elegant room settings as they are soft and luxurious. Also a great option as tapestries on walls. 5. Turkish Chandeliers – Ceiling and Table Lamps elaborate in mosaic are perfect for brightening any space with a bohemian touch. Istanbul is the center of Turkish glass making, a tradition that has materialised into one of the most beautiful Ottoman arts. These lamps are made by artisans who have inherited the technique of hand-cut coloured glass, a skill that is centuries old in Turkey. If you are traveling to Istanbul, one of the best places to buy them is at the Grand Bazaar as they have a large variety of designs and colours. But if you are ready for a new, enjoyable experience, I recommend asking at the tourist office for Turkish lamp workshops, where they teach you how to make one. Hope you had enjoyed these Istanbul-inspired Interior Décor and Design Ideas. With so many options to choose from, you can easily add a splash of Ottoman influence to your home without breaking the bank or completely changing your interiors. It has modular influences, which means you can keep adding touches over the years to ensure your home continues to evolve alongside your travels. Please share your ideas and suggestions in the comments box below. I would love to hear from you.